The Hierophant card is numbered 5 in the Tarot. This card is one of the Major Arcana cards. The Hierophant meaning often describes following a traditional structured and formal approach. The Hierophant often indicates a forthcoming marriage. This card can also represent any structured group with rules and assigned roles. It can show a need for group activities and learning. It often refers to someone conforming and following the rules or taking an orthodox approach to a problem. 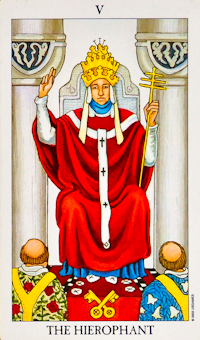 The Hierophant can also indicate a need to do the right and honourable thing. It is often a warning in Tarot Readings and shows that morals might be questioned. The Hierophant, as with all the Major Arcana can be a representative of an individual or aspect of a personality. The Tarot card meaning for this card can indicate someone with a somewhat old fashioned and traditional belief system. Someone of high moral standing who perhaps is a teacher or spiritual leader. It can also point to someone born under the sun sign of Pluto. In questions concerning love and romance in Tarot Readings the appearance of the Hierophant Tarot card can often foretell a marriage proposal. It can show a more structured and formal approach to a relationship may be necessary. When the Hierophant has prominence in Tarot Readings concerned with career or business questions the Hierophant Tarot card often represents being given the opportunity to learn. Someone may make an entrance and turn out to be a guide, mentor or coach. The Tarot card meaning can also show a need for teamwork. Working together cooperatively may get you where you want to be faster than working on your own. For money and finance questions asked in Tarot Readings the Hierophant card often represents a need to be entirely honest and deal with money matters head on. It warns against reckless overspending and risk taking or gambling. The Tarot card meaning of the Hierophant in questions of finance usually means you must follow the rules and live within your means. The Tarot card meaning for questions concerning health usually indicates a need to follow a health regimen that is structured. This may mean following a diet or exercise routine to improve health. It can also mean turning to traditional medicine. If the Hierophant is prominent in a Tarot Spread it can show a strong link to giving and receiving spiritual knowledge. It can indicate teaching or learning. You may need to think about giving up some of your routines, your old way of thinking and doing things, and to move into the unknown and learn something new. The reversed Tarot card meaning of the Hierophant Tarot card can show a difficult time ahead in regard to money matters. It can show a period of bad luck that seems to have no end in sight. Another meaning of the reversed Hierophant Tarot card is that of ignoring the sound advice from others. The Tarot Hierophant card can often show a need for addressing money matters head on. The most potent and powerful way to do this is by having a Money Spell cast.